New Year Resolution. – Oh, I see! So my New Year resolutions this year are many. One of them is to sketch daily. I’m a bit late that way since it’s the 9th today but I shall upload earlier sketches anyway. 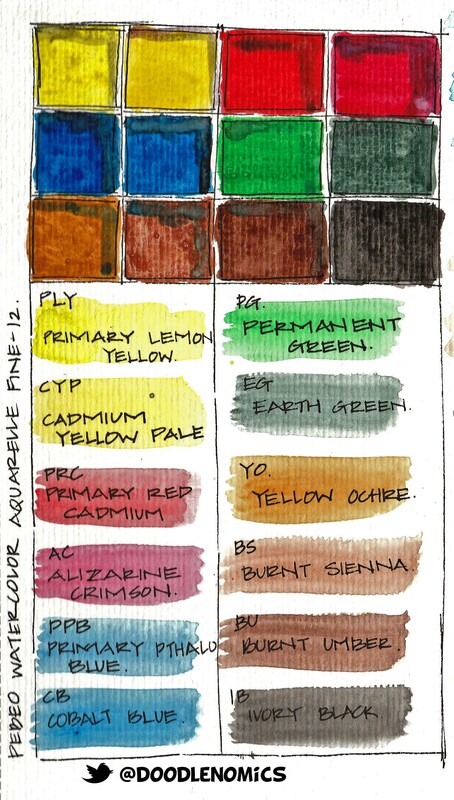 This first post has a picture I drew of my current kit and color swatches of the paints I have used/ tried- Pebeo, Camel Kokuyo and Sennelier. 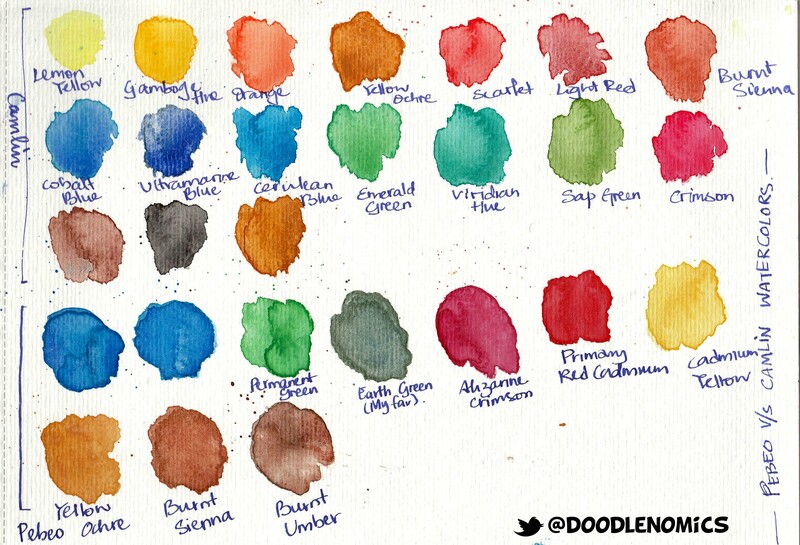 I started out with a Lyra children’s paint box which gave me pretty good results (I think) and I’ll remind myself to post a picture of their color swatches. Camel is a well-known art supply brand in India (probably ‘the’ art supply brand) and I bought their 18 color cake set to try out . I have used acrylic paints from Pebeo earlier and they were pretty good so I figured these would be great too. I liked the results of all and so far, couldn’t really differentiate or pick out a flaw. My current kit is pretty simple with the fewest things possible. 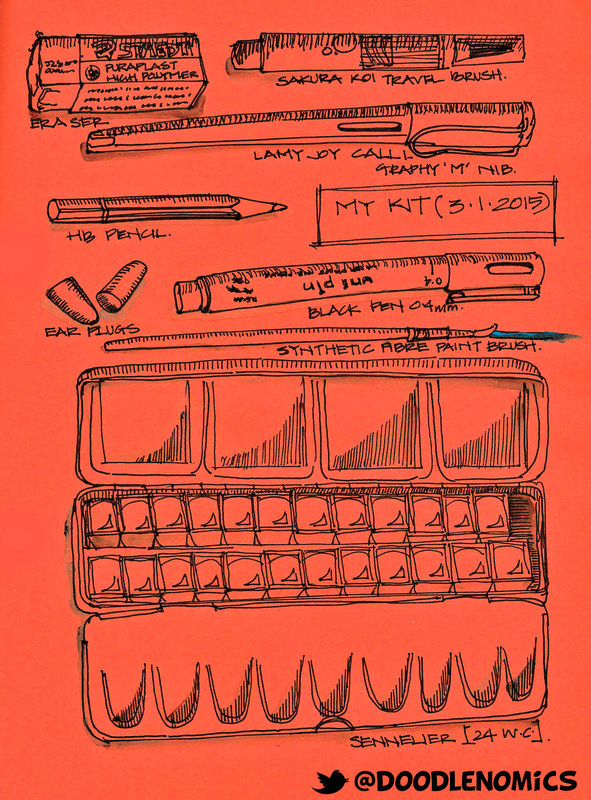 It contains a plastic eraser, a Sakura Koi travel water brush in medium, a Lamy Joy calligraphy pen with a medium nib, a unipin black liner (0.4, 0.5, 0.7- whichever I have at that time), a HB pencil, ear plugs to cancel any noise that can be distracting on location, synthetic hair paintbrush that comes with paint boxes and a 24 watercolour set from Sennelier.